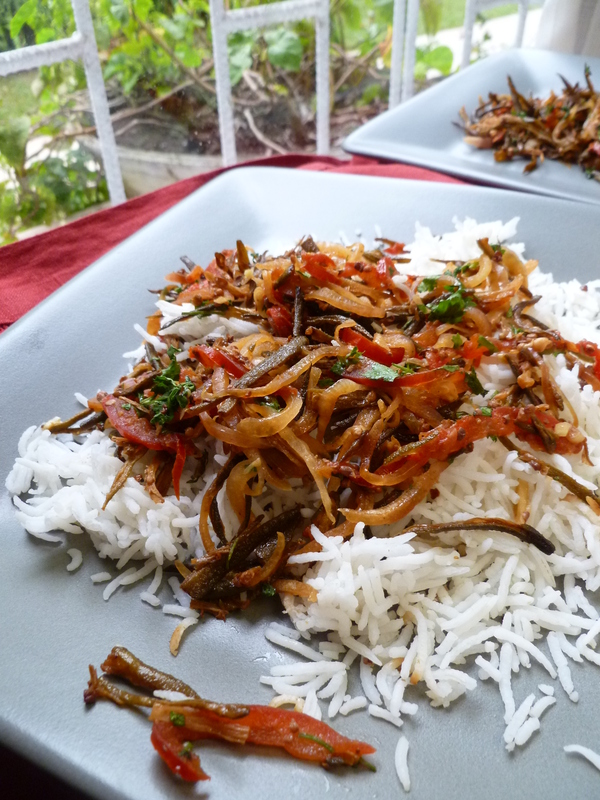 An essential ingredient in this way of preparing okra (aka lady’s fingers) is the spice blend chaat masala (Urdu چاٹ مصالہ, Hindi चाट मसाला). Chaat masala contains dried mango powder and asafoetida, both of which have very distinctive and, to the uninitiated Western palate, surprising–perhaps even peculiar–tastes. My own early encounters with this masala were at a chaat (snack) vendor’s stand in the Jor Bagh market of New Delhi and the taste did not immediately register as entirely positive. Rather, it seemed…a curious flavour mélange. Eventually, however, like some personalities that grow on you by closer acquaintance, I developed a hearty appreciation for chaat masala’s assertive character. 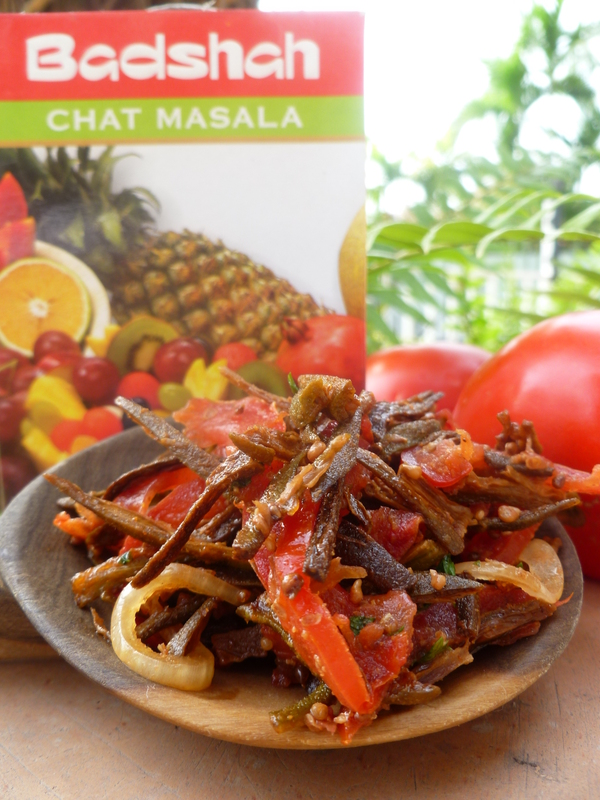 Prepackaged chaat masala mixtures are available. To any reader who has never tried this interesting spice blend, I recommend it as a new gastronomic experience and, perhaps subsequently, a new addition to the range of spices you use in your cooking. Timing Note: This way of preparing okra should be served at room temperature. The okra may be fried in advance and the other ingredients cut up and set aside and everything mixed together just before serving. 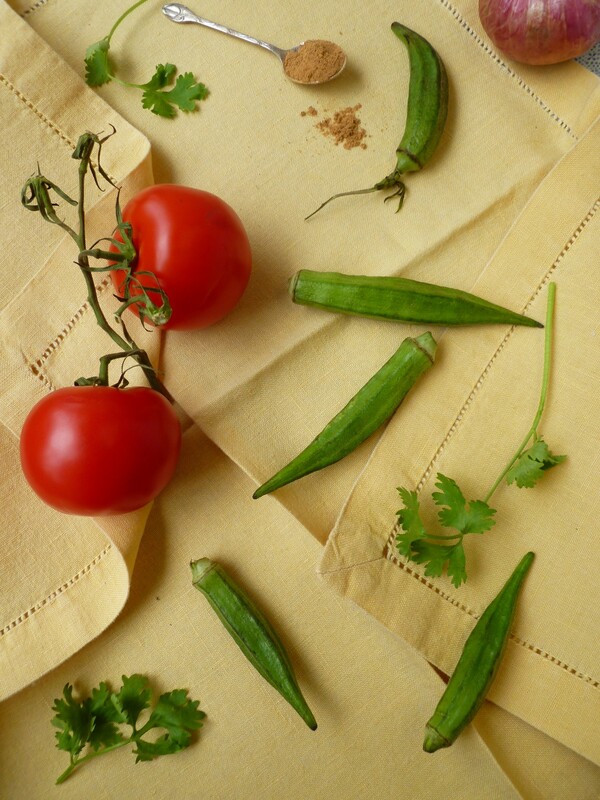 The fried okra and cut-up shallots, tomato, coriander and spices may be packed separately to take along on a picnic and mixed together ‘in situ’. 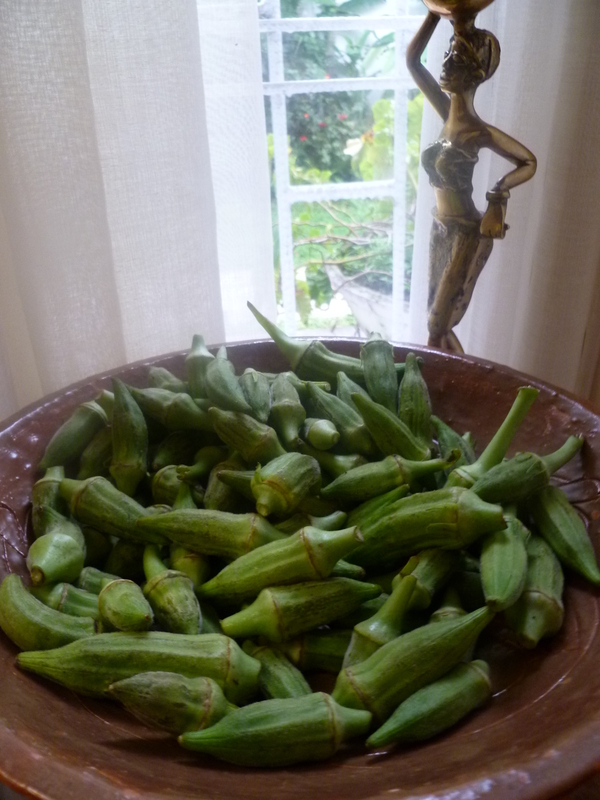 2 pounds of small, tender Okra, tops and tails cut off and cut into julienne strips (i.e. long, thin strips)…See the note about what constitutes ‘tender’ okra below, just before the recipe. 1. Pour enough vegetable oil in a deep, heavy-bottomed pot (or other vessel) to allow the julienned okra to float freely as it fries. Heat the oil over medium heat to 350 F and fry the okra in small batches, very quickly, just until the edges of the strips begin to turn golden. 2. Drain the okra on brown paper bags or paper towels. Set the okra aside until just before serving. It is not reheated. 3. 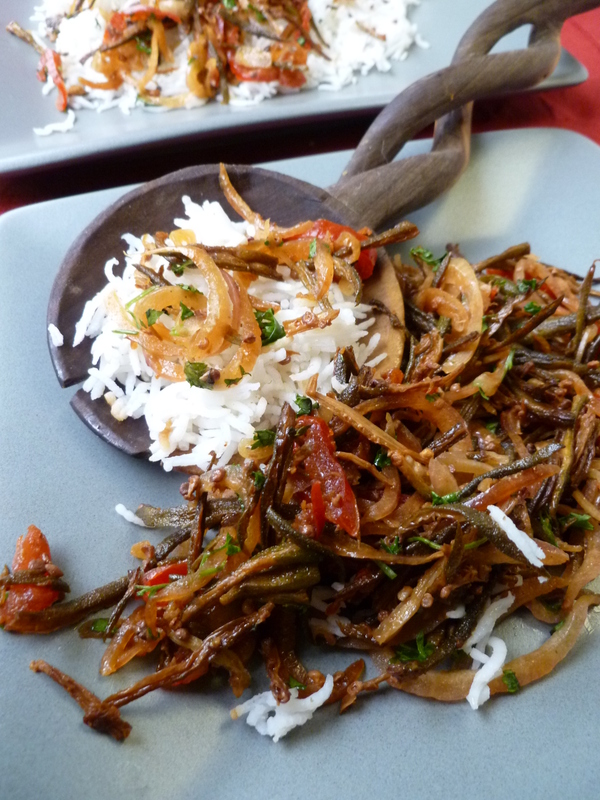 Just before serving, mix the okra with the shallots, tomato, coriander, salt and chaat masala. 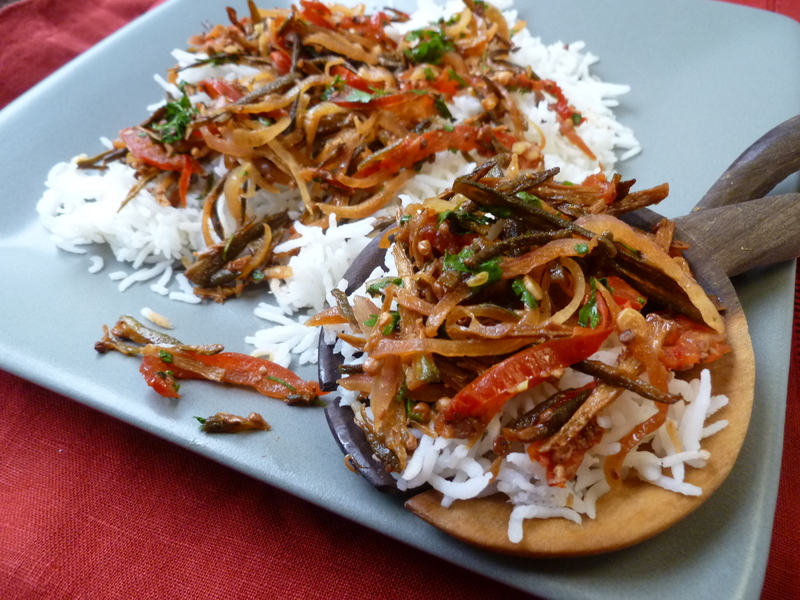 Taste and correct add more salt or chaat masala if you like. Serve this dish at room temperature.